Cannabis is taking over the country one neatly trimmed bud at a time. As job candidates recover from a harsh recession, the legal marijuana industry promises a booming, exciting new industry with jobs that pique the interest and pay the bills. The process of transitioning from non-cannabis careers into the industry may seem daunting, but there are more connections between the job you have now and your future marijuana career than meets the eyes. Disgruntled service industry workers unite! Having personally spent years working in food service, it became quite clear how monotonous the work was when I didn’t care about the product we were selling. For the passionate pothead, working in a cannabis dispensary might be your ticket to a more rewarding service job, that comes with opportunities for job advancement. 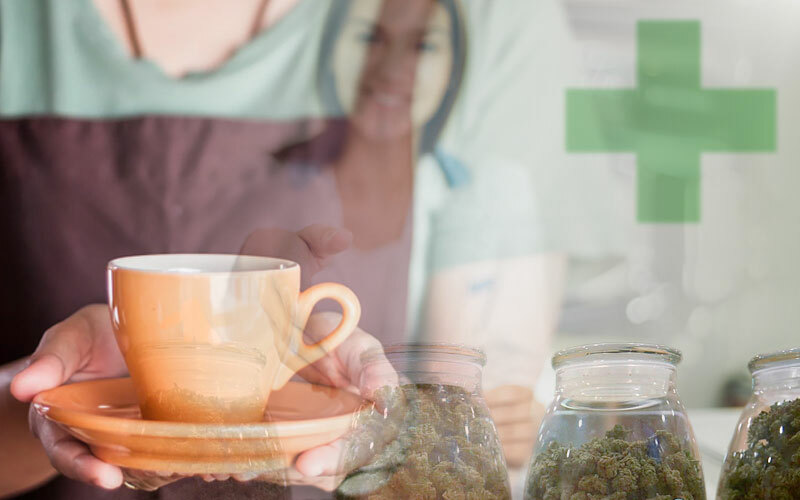 If you work as a barista, bartender or server, odds are you may be able to transition into a job as a dispensary budtender. Just like coffee slingers and barbacks, the work of a budtender is primarily invested in direct customer service. Budtenders guide customers through understanding and selecting from the cannabis products at their disposal, in order to suit their individual needs. Budtenders retain in-depth knowledge of cannabis products and legislation, securing them as credible members of the cannabis community. Though budtender tasks are tailored to the marijuana industry, there is noticeable crossover between associated jobs outside of the industry. For starters, budtending is a somewhat entry level pursuit, though the competition for jobs is stiff. This is not unlike working as a bartender in a high profile location in cities across America — as more college educated individuals find themselves working in the service industry, competition for the most ideal jobs with the highest payout is exponential. The daily routine of a budtender aligns similarly to other service industry workers. Shifts often last around eight hours or fewer, requiring workers to stand for long periods while communicating with other employees and customers as well as maintaining the dispensary by cleaning and organizing. Budtender wages are in keeping with the standard set for most customer service jobs, beginning at minimum wage and averaging between 10-12 dollars per hour. Most dispensaries allow budtenders to receive tips, though the amounts vary drastically from store to store. One clear difference between cannabis and the products that bartenders and baristas sell are the plant’s medical implications. Working as a budtender requires a studied stoner, who is well-versed in all the medical benefits of cannabis and how specific strains will work for specific people. You can become educated in budtender practices by taking online certification courses through job training programs like THC University, which give you access to courses that introduce you to a thorough cannabis education. For employees of warehouses and assembly lines, cannabis bud trimming is a lucrative job that puts you in close quarters with cannabis flower. If you’ve heard that trimming is a tedious job, you’re right! For marijuana enthusiasts, the repetitive work of snipping away excess plant matter from the trichomes is preferable to other assembly or warehouse positions. One of the benefits of being a trimmer is that the wages are often determined by weight produced over a period of time. Therefore, speedier, more precise workers can be compensated more heavily based on skill. While bud trimming jobs start around twelve dollars per hour, great trimmers have been known to make around twenty per hour all said and done. All things considered, trimming isn’t very different from processing other products in a production line setting. At very least, trimmings jobs allow workers to begin making their stake in the cannabis industry, creating future potentialities for becoming an assistant grower, or eventually leading a grow operation. For individuals who would rather work in silence than interact with customers all day, trimming can be a meditative, quiet pursuit that allows the worker to let their mind wander or enjoy music. Unlike some factory or warehouse jobs, trimming positions expose workers to a passionate cannabis community. Most marijuana industry workers pursue jobs in this field because they love cannabis. Being surrounded by folks with common interests and goals can be more encouraging than working for a generic production line. Learning how to trim mature cannabis flower isn’t necessarily hard, but it is an acquired skill that comes with practice. Once colas have been harvested from the plant, most trimmers begin the “wet trim” process, snipping away fan leaves, sugar leaves and any dead or diseased plant matter from the cannabinoid and terpenoid rich buds. Trimmers must use gloves during work, to protect their hands from the sticky resin they encounter. In this way, the job can be a bit messy, which calls for an organized worker. Learning how to trim is really more about learning how to trim efficiently. The end product of trimmed cannabis should result in tight, uniform looking flowers that contain high concentrations of THC and/or CBD. Calling all line cooks, early morning bakers, sous chefs and more: there are now legal, paid opportunities to cook using cannabis. While many a college stoner consider themselves marijuana chefs, finding a job in a professional cannabis kitchen is a hotly pursued career. Cannabis edibles come in all shapes and sizes and are packaged and sold in dispensaries around the state. As edibles have become more legitimate under the legal industry, their novelty has skyrocketed with recreational consumer interest. Arguably, the most important use of edibles is for medical marijuana patients who require higher doses of THC and CBD for more sustained periods of time than can be achieved through smoking flower. There are some obvious connections between “regular” chef jobs and marijuana edibles chef jobs, namely when it comes to making a consistent product. First and foremost, edibles chefs have to be expert cooks or bakers who are comfortable taking leadership roles in the kitchen. Like all cannabis jobs, compliance is a necessary hurdle of daily operations, so chefs must be organized and confident in their routine. Aside from cooking the tasty treats themselves, edibles creators must infuse their goods with cannabutter or concentrates. The traditional method of cannabutter involves taking cannabis flower and trim, adding it to oil or butter and letting it gently cook over heat to extract the cannabinoids. Special attention has to be made to make sure the flower doesn’t overheat, otherwise it will be rendered less effective. The other method for infusing cannabis in food is by using cannabis concentrates. Concentrates have a less earthy taste than cannabutter as the plant matter has been extracted, leaving only the essential compounds like cannabinoids and terpenoids. Cannabis extraction is carried out by using solvents like CO2 and Butane. The process requires a highly skilled chemist, as the job involves extreme heat and the potential for danger. Most edibles chefs are forbidden by the state to taste their products, once the cannabis has been added. Therefore, chefs must be confident in their products and their measurements. Realistically, the concentration of cannabis found individually in edibles ranges vastly, but the goal is to create a uniform product. The beauty of the legal cannabis industry is its far-reaching arms into many different job sectors. Regardless of what career you are involved in currently, there will likely be areas of crossover between the post you have now and your dream job in cannabis. As more positions continue to open up, be on the lookout for opportunities that make themselves available!